Here’s an example of an insider D.C. story any journalist would love to have written. It opens like a version of an old joke: Two White House lawyers walk into a restaurant. Sitting next to the Administration mouthpieces was Ken Vogel, a terrific investigative reporter how recently moved from Politico to the Washington bureau of the New York Times. To get things straight the article is written about Ken Vogel’s eavesdropping. It was written by Fred Barbash in one of his Morning Mix columns for the Washington Post. 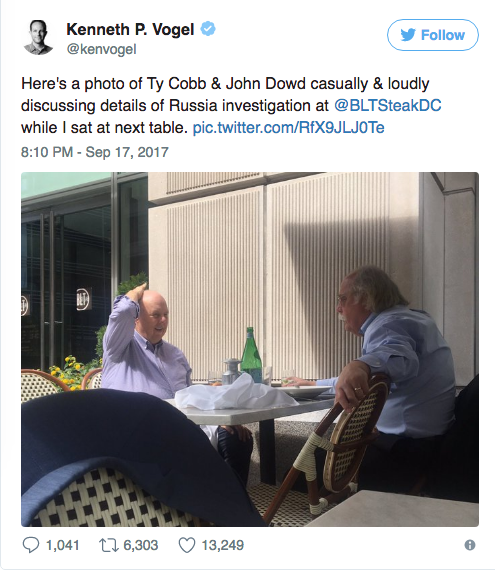 “...Sitting at the next table, according to the Times, was Kenneth Vogel, one of Washington’s most skillful investigative reporters.Vogel is a former reporter for Politico, which is based in Virginia, who arrived at the Times just in time for the Russia investigation and, as it turned out, just in time for lunch. … Mr. Cobb also discussed the June 2016 Trump Tower meeting and the White House’s response to it — saying that “there was no perception that there was an exchange...” [End Vogel]. Like we said it’s hard to make up any of this—but then again it is Washington DC. [From Wikipedia]: Kenneth Vogel is an American journalist. He was the chief investigative reporter at Politico, since its founding in 2007. 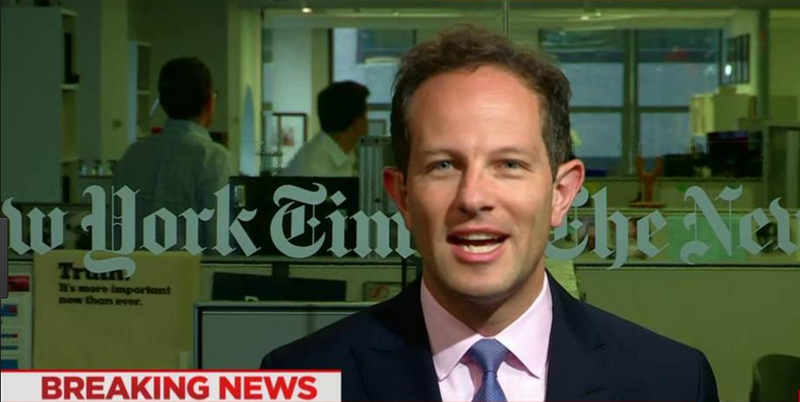 In June 2017, he joined the Washington Bureau of The New York Times as a reporter covering conflict of interest issues, lobbying and money in politics. He is also the author of Big Money: 2.5 Billion Dollars, One Suspicious Vehicle, and a Pimp–on the Trail of the Ultra-Rich Hijacking American Politics. Vogel's writing often focuses on money in politics. As part of his work, he focuses on political fundraising with particular emphasis on the political activities of the Koch brothers.